It’s back to Bowen Designs tonight, and this time I’m looking at another of their website exclusive pieces. 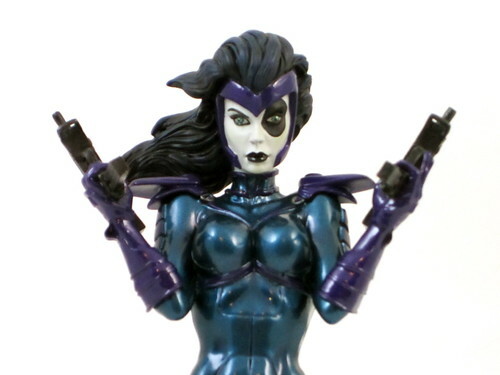 This time around, it’s the Bowen Exclusive Domino Mini-Bust . Domino may have recently been shuffled out of the X-Force line-up in the comics, but she can still be front and center on this happy statue collector’s shelf! This bust is based on Domino’s early appearances, and fits quite well with the Retro Cable Mini-Bust from a couple of years back to create a bit of an original X-Force “feel”. This first appearance style is likely to be pleasing to fans of the ‘90s era of X-Folk. 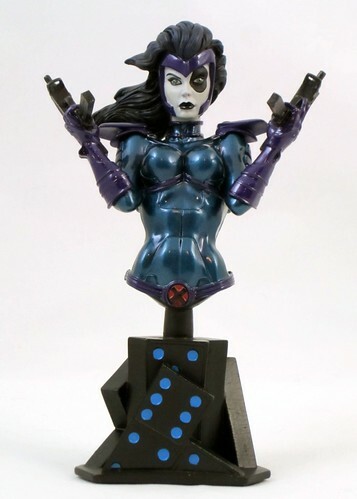 When this bust started shipping, there was a bit of web panic on a couple of forums about the angle of the statue in relation to the base, specifically that Domino was leaning too far back and to one side. This seemed to mostly be based on one reviewer’s photo, which was clearly not taken at a straight angle. In person, there is no issue. The figure is leaning slightly back, but that is because of the way she’s holding her guns, and the angle on my piece at least is perfectly straight. Crisis averted. The sculpt on this figure is in fact very tight. There is a fine amount of detail in Domino’s uniform, her weapons and her fair. The entire piece is beautifully sculpted. This bust has one of the nicest paint jobs I’ve seen on a bust in quite awhile, due in a large part of the very nice use of metallic paint. There are two metallic blues and one purple that work very well together, and also provide an excellent contrast to Domino’s white skin, black eye and black hair. The end result is that all of the metallic colour highlights her face and makes it more striking. The one criticism I have of this piece is an issue that has come up with a few Bowen females lately, and that’s the blank facial expression. She certainly beautiful, and the arched eyebrows help a bit in terms of giving Domino some character, but the eyes and mouth don’t give us much else to respond to. It’s a hard ask, as I am not always a fan of open-mouthed sculpts, but a bit more is needed here to really bring life to this piece. It’s beautiful to look at and I’m glad to have it, but it is just missing that little “spark”. I always like bases that make sense for the character, and this bust excels in that department. The use of dominoes might seem a bit literal, but it’s also a clever way of creating a meaningful base for the character. The base is made up of a number of dominoes arranged at different angles, with blue dots to tie in to Domino’s uniform. All of the elements of this piece really do pull together to make quite a cohesive whole. One of the things I love about Bowen’s Marvel output is their willingness to delve well beyond the top tier of recognisable characters. Domino’s X-Force appearances were the first time that I really came to know the character. Her interaction with Vanisher were interesting and I was sad to see the exploration of that cut short by the revamp of the book. I’d love to see her get a Full-Size Statue treatment with a modern age, X-Force look!